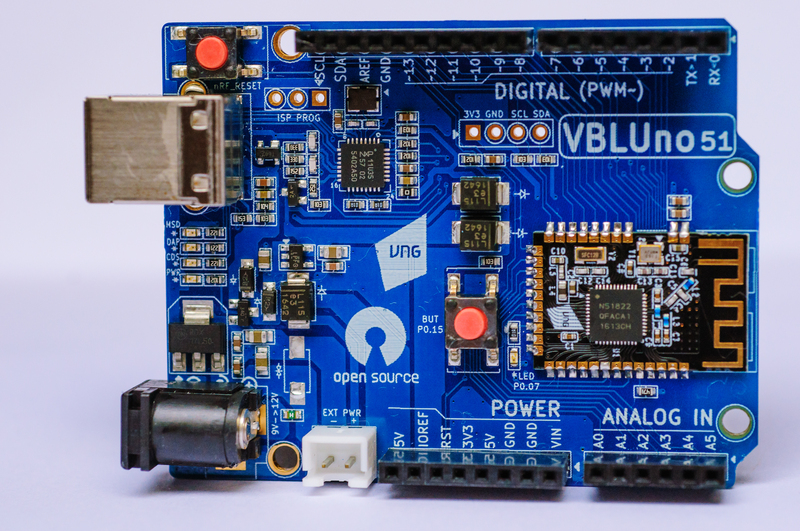 After a time introducing the VBLUno development board to community, VBLUno board has helped developers quickly access Bluetooth Low Energy technology for developing Internet of Things applications. Using nRF51822 microcontroller (ARM Cortex-M0) with BLE interface on chip, help users acces easy and master this technology. Stable, ultra low power consumption when communicating with the Smartphone via Bluetooth Low Energy. In addition to the above advantages, the first version of VBLUno still exist shortcomings such as: not integrating an interface that allows loading and debugging easily. With the first version, for easy loading / debugging, users need to add the CMSIS-DAP module. It is a little confusing for the user. With the spirit of listening from the community, we have upgraded the VBLUno to 2.0 version, called VBLUno51, essentially integrating the CMSIS-DAP module (DAPLink) on VBLUno circuit and some other important improvements related to power and peripherals. Thus, loading the program for the VBLUno51 board will be much easier, you can see the Getting started entry to know how to load the program for VBLUno51.